Blade debitage is a characteristic production pattern of specific periods and regions during Prehistory. In South America, it is well documented in Argentina, in contexts dating back to early Holocene. In Brazil, it was unknown until 2006, when it was found in three archaeological sites (ACH-LP-01, ACH-LP-03, ALP-AA-03) in the Foz do Chapecó area, upper Uruguay River, South Brazil, in layers from early Holocene. It was associated there with a great variety of other production systems: bifacial shaping of projectile points and large tools, unipolar debitage of large flakes, bipolar debitage of tiny flakes. Silicified sandstone, chalcedony and hyaline quartz are the main used raw materials. To this day, only the products of this debitage, the blades, had been discovered. Cores were lacking, which prevented a complete understanding of the flaking process. Due to the resumption of research in the region from 2013, it was possible to find those cores during surveys in the two following archaeological sites: ACH-LP-07 and RS-URG-01, located on both sides of the Uruguay river, near the mouth of the Chapecó river. We describe in this article five of these cores (4 from ACH-LP-07 and 1 from RS-URG-01). Their analyses demonstrate that this blade debitage complies with only one concept. The core volumetric structure that is the result of this concept displays the following features: 1) Cores have two surfaces: a flat back and a convex but relatively flattened flaking surface, so that they have a general “D” shaped transversal section. At one end, a small surface acts as striking platform during the production of the blades; 2) Debitage begins with a initialization phase of the core during which the striking platform is produced by a large removal. According to the natural properties of the initial volume, the back of the core is obtained either during the selection of the blank, and then it is left in his natural state, or by a preparation by one or more large transversal removals. When present, the scars of the initialization phase of the flaking surface indicate the use of a centripetal method. This preparation is made possible by the acute angle of the peripheral ridge formed by the intersection of the back and the flaking surface ; 3) Blades are always produced by a unidirectional parallel method. Production variability is mainly related to the flaking technique: both internal percussion by stone and marginal percussion by organic percussor were used to get the blades. Technical information provided by the cores are complementary and in accordance with those from the previous analyses of the blades from the same area. 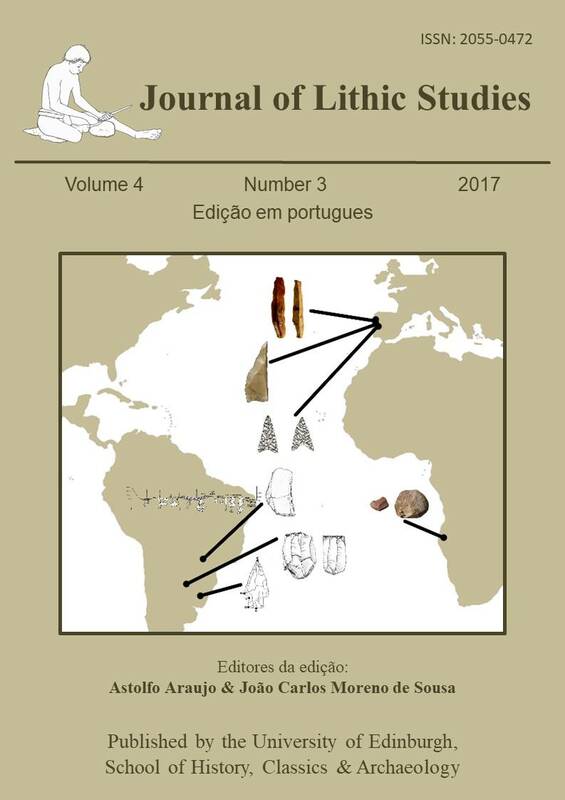 With these two studies it was possible to reach a relatively exhaustive understanding of this production system in the upper Uruguay River during early Holocene, the only well documented blade debitage in Brazil known until now. Future research will explore the interactions between this production and the other debitage and shaping methods inside this early Holocene technological system. To do this, we will develop a comprehensive study of all lithic artefacts from the archaeological layers in which blade production was identified. In a wider scale, a comparative approach with Argentinian and Uruguayan prehistoric blade productions will allow to better understand the development of the blade phenomenon in the southern cone of South America.